Grace Bible Fellowship supports AIO and is a food collection site. If you, or someone you know does not have enough to eat, please contact AIO directly for assistance and resources. Please consider supporting this important ministry in Mid-Coast Maine by donating food, money and by praying. In Maine, from 2010 to 2013, the number of people working full-time but living in poverty grew by 11%. In those years, wages for the worst-paid workers declined by 8%. 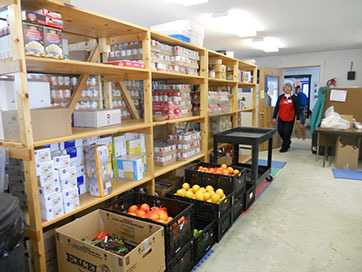 AIO is a member of Good Shepherd Food Bank’s network of food pantries in Maine. The AIO food pantry is open three mornings a week (MWF), from 9:30 to noon. Notes: Your household may come for food once per calendar month. The amount you’re given is based on the size of your family, enough for about three days. That usually includes frozen meat, fresh produce, baked goods, and eggs, plus canned and boxed food from the shelves. It’s good if you bring your own bags, but we can supply plastic grocery bags for you. Emergency Assistance If you are nearly out of heating oil, kerosene, or propane, we may be able to help with as much as 50 gallons. Other help is possible (e.g., electricity, water, sewer, rent). What we give any household cannot exceed up to $300 per year. We can also refer you to other places to look for additional help.